Many of us stop reading to older children once they've learned to read independently. This is such a shame because the benefits of reading aloud don't stop at a certain age. In fact, there are good reasons for continuing to read aloud, even into your child's teen years. The general consensus among the experts seems to be that a child's reading age catches up with his listening age at about the age of 13 but even then there's no reason to stop reading aloud. Remember that it’s only in fairly recent times that reading aloud has been seen as an activity for children. 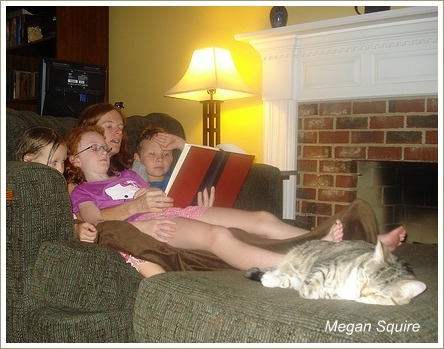 Before TV came on the scene, it was common for someone to read aloud to the family after dinner, either from the newspaper or from a book. If your child is eight, he will probably have a reading age of around eight. This means his reading skills and abilities are exactly what a teacher would expect from an eight-year-old. But your eight-year-old will have a listening age at least a couple of years ahead of his chronological age. His listening age will probably be at least 11 or 12 years old. This means he'll understand and enjoy listening to you reading books which were written for 10-12 year-olds to read on their own. This is one of the great reasons for reading to older children: so that they can enjoy books which they would find difficult to read on their own. I really think the whole family benefits when you continue reading to older children. Here are my five great reasons for reading to older children. is a lovely way to spend quiet time with your child after you've all had a busy day at work and at school. Before bed is the traditional time to read aloud but any time that suits you both is fine. Try a quiet Sunday afternoon, for example. When your child is ill is another good opportunity. He or she will enjoy the one-on-one time. enables your child to hear richer, more complex stories that he may not be able to read himself. Among other things, this builds background knowledge (general knowledge) which will help him do better at school. extends your child’s vocabulary because he has the opportunity to hear more complex language and to ask you about any words he doesn’t understand. creates a wonderful bond as you discuss the story, look forward to reading the next installment each night and wonder together in between reading session what will happen next. encourages a love of reading and books. Any book that's just a bit above your child's reading level is probably a good choice. The classics are good because, sadly, most kids today won't read them of their own accord. Here are six books that our family has enjoyed reading together. This is a great one for kids aged from about six years old. It's a bit too hard for most children this age to read independently but they'll love listening to you read it. Make sure you tell them that the book's much better than the movie. My husband started reading the Harry Potter books to our twin sons when they were about six-and-a-half. They were entranced by the stories but the sophisticated writing was beyond their own reading abilities at that stage.Sharing a new chapter of these books every evening was a very special experience for all three of them. 2. The Lion, the Witch and the Wardrobe is another good one for 6 - 8 year-olds. I read this one when the boys were about ten and my daughter was six.It was a book I'd loved as an eight-year-old when my Year 3 teacher read it to our class so I was quietly thrilled when my kids loved it as much as I did. A side benefit was that it was a great way to introduce the Second World War and to explain a bit about what happened (without any gruesome stuff). The Silver Sword was first published in 1956 and is based on a true story.It's the story of three Polish children, Edek, Ruth and Bronia, whose parents are taken away by the Nazis and whose home is blown up, leaving them to fend for themselves. How they survive the war and the chaotic aftermath to go in search of their parents is an amazing story which absolutely enthralled my kids. 5. The Hobbit was another success story at our place. Try it with eight-year-olds and up. 6. In the lead-up to Christmas, why not try reading some Christmas stories with your older kids? The Charles Dickens classic novella (short novel) A Christmas Carol is a great book to read to older kids.They'll probably be familiar with the Disney version so explain that this is the original story and that Disney, Little Golden Books and all the cartoons that parody it got the idea from this book. Kids aged 9+ are probably the best audience for A Christmas Carol but try it with your younger kids if you think they'll be receptive.There are five short-ish chapters so you could try reading one a night in the week before Christmas. 7. Lucy M Boston's The Children of Green Knowe is the first book in a classic fantasy series for kids. It dates back to the 1950s, '60s and '70s and was very well-known in the UK and in Australia. The books were probably not as famous in the US but they're well worth seeking out.Try the books with 8-10-year-olds.